So, I’m pretty sure that Little Crafter was just as excited as I was when we unpacked our box o’ fun and saw all the different kinds of Mod Podge to play with! He was particularly excited that there was one just for kids, and told me we needed to make something with it. Well, I do have a reputation to uphold as one artsy mama, so how could I say no? But what to make, what to make? I looked in my stash and found a few of those empty clear plastic ornaments you can get in craft stores around Christmas time. I also had some tissue paper on hand that happened to be good colors for the season. So, we decided to make a Halloween centerpiece featuring decorated ornaments. Since each ornament would be different, it would give us the opportunity to try out a number of different Mod Podge formulas. Then, we applied Kids’ Mod Podge to the surface of the ornament and Little Crafter placed the pieces of tissue paper wherever he wanted them to go. Once the entire ball was covered, we chose a type of Mod Podge to use on top and coated the whole thing to seal the tissue paper in place. After drying, we could add embellishments like ribbon. If you were going to make a Halloween tree or hang them from the ceiling or light fixture, you could do that too, but since ours were going to sit in a bowl, we didn’t actually need hangers. This one uses purple and orange tissue paper and Sparkle Mod Podge. For this one, we were going for a candy corn effect, so we used white, yellow, and orange tissue paper. This time, we played with the Super Gloss Mod Podge. It definitely came out shiny! This one is simple; just purple tissue paper and Sparkle Mod Podge…can you tell we both love glitter? That’s a verbatim quote. I love that kid. Once our ornaments were all dry, we decided to arrange them in an orange bowl I found for a great price at Target. We filled it with dried black beans, then arranged our ornaments on top of them. Either way, it’s a quick and easy project, and cheap too! All you need are the ornaments which you can get for $1 a piece or less, scrap tissue paper, and Mod Podge. This total project cost me less than $10; not bad for a centerpiece. That LC worked that centerpiece! Nice job little dude- they look fantastic!! Cute idea! I’ve been looking for DIY centerpiece ideas…. That is so cute! I love that LC was able to get in on it too! Thanks for sharing at the Pomp Party! This is so cute and looks like fun. 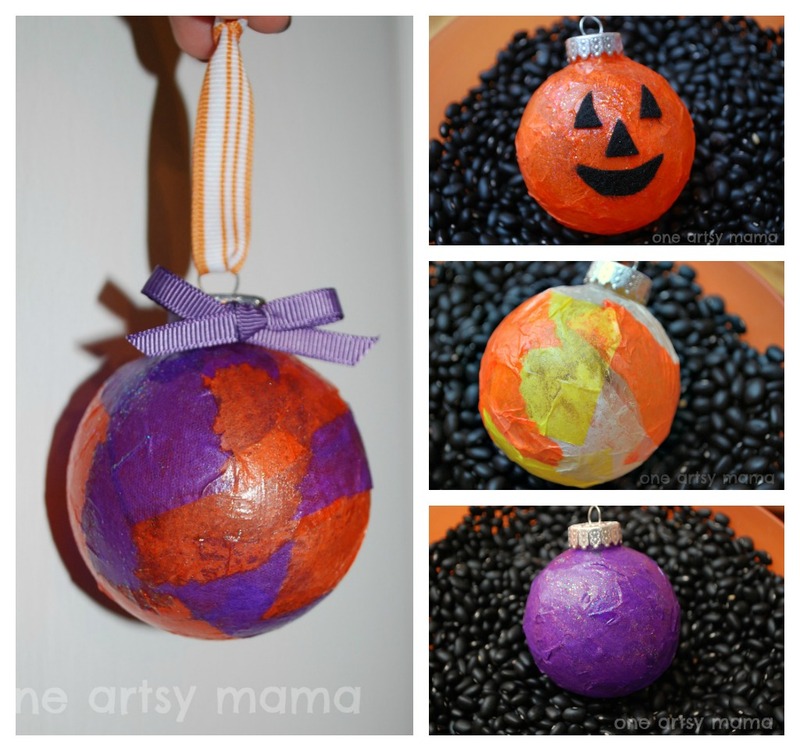 I love the idea of using Christmas ornaments in other ways and for other holidays. Oh, how fun!! They came out wonderfully! Thank you for sharing at Sharing Saturday! Thank you for sharing your project on A Crafty Soiree! I’m pleased to let you know I’ve featured it in the newest one. Please come see it ☺, it will be up at midnight EST tonight.